TI 84 graphing calculator in really good condition! Works perfectly, needs new batteries. TI-84 Plus Scientific Calculator. Condition is Used. Dispatched with Royal Mail 2nd class. Sold as seen, no micro USB included, thanks for viewing. 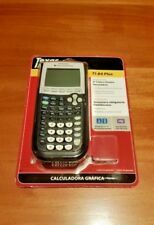 Texas Instruments TI-84Plus Graphic Calculator with cover and batteries. Condition is Used. Is clean and looks brand new. No scratches or signs of wear. Dispatched with Royal Mail 2nd Class. TI-84 Plus CE-T functionality with a high-resolution colour display. Product Specifications. Contains a USB Computer Cable for computer connectivity. 11 pre-loaded: Cabri. Includes all the functionality of and is fully compatible with the TI-83 Plus. Argos will then notify you when your order is ready for collection. The TI-84 Plus CE-T has advanced graphing capabilities and improved interface features, with a high-resolution colour display and the ability to use images, making mathematical visualization more interesting and encouraging better understanding of difficult concepts. TI 84 Plus, including USB link. USB on-the-go technology for file sharing with other calculators and connecting to PCs. If there's a problem, just let us know and we will fix it. Familiar TI-84 Plus functionality. Built-in MathPrint functionality allows you to input and view maths symbols, formulas and stacked fractions exactly as they appear in textbooks. Visualize concepts clearly and make faster, stronger connections between equations, data, and graphs in full colour. It has a built in USB port and USB cable included for connections with computers, classroom display tools and data logging devices and sensors. - Optional: TI-SmartView Emulator Software for the TI-84 Plus Family. There is no original TI-84, only the TI-84 Plus and TI-84 Plus Silver Edition models. 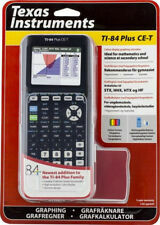 The TI-84 Plus is an enhanced version of the TI-83 Plus. A USB port and built-in clock functionality were also added. Probability distributions. The TI‑84 Plus is an enhanced graphics calculator, ideal for secondary level maths and science education, with a built-in USB port and an included USB cable for connections with computers, classroom display tools and data logging devices and sensors. (included). Customize your learning with TI-84 Plus C graphing calculator applications. The addition of applications extends the functionality of your calculator, allowing you to perform specific math and science functions and deepen your understanding of concepts. Import images to analyze mathematically. Graph Calculator. Item model number: 84PLCE/10P/1E1. Add to Favourites. Contains a USB Computer Cable for computer connectivity. 11 pre-loaded: Cabri ® Jr. Scottish Highlands & Islands and Isle of Man. Northern Ireland, Channel Isles. Model Number: TI 84. USB cable included. Manufacturer Part Number: TI 84. With the TI-84 Plus Presentation Link, any computer (student and teacher model) can be connected to the Overhead Display ViewScreen or the TI Presenter. Texas Instruments TI-84Plus Graphic Calculator. Condition is Used. Dispatched with Royal Mail 1st Class. (included). Form factor: Desktop, Type: Graphing. Digits: 14 digits, Display tilting, Backlight display. USB port, USB 2.0 ports quantity: 1. Power source: Battery. Colour of product: Black. TI-84 Plus functionality with a high-resolution colour display. We do not take any responsibilty after this. We Accept Only. Ending Soon. New Arrivals. QUICK LINKS. PC Components. you can buy in set of 6 max. Why Choose Us! Good condition, used graphing calculator, perfect for high level mathematics. Contains A USB Computer Cable For Computer Connectivity. Includes All The Functionality Of And Is Fully Compatible With The TI-83 Plus. Connect All Units (Student And Teacher Models) To The ViewScreen™ Panel Or TI-Presenter™ Via The TI-84 Plus Presentation Link. This calculator is in excellent condition. Real and complex numbers calculated to 14-digit accuracy and displayed with 10 digits plus a 2-digit exponent. Ideal for middle school through college. 14 interactive zoom features. I/o port for communication with other TI products. Horizontal and vertical split screen options. I/O port for communication with other TI products. Power Sources: Battery Display Notation: Graphic Number of Display Digits: 10 Display Characters x Display Lines: 16 x 8. Type Graphing. Power Source Battery. UPC Does not apply. HAS SCRATCHES & WEAR FROM PREVIOUS USE . IN GOOD CONDITION . REQUIRES 4 AAA BATTERIES, NOT INCLUDED . It’sbeen used but in a very good condition. Type Graphing. Model TI84 PLUS Silver Edition. Power Source Battery. Create graphs and do other advanced equations with the TI-84 Calculator. t features a full-color, high-resolution screen and a sleek, slim look. An item that has been used, but looks brand new. There may be signs of cosmetic wear, but is fully operational and functions as intended. Comes with the cables it came with and in the original box. Batteries Included. TI-84 Plus CE Graphing Calculator TI84 Blk FFP. Product Type: Graphing Calculator. Manufacturer: Texas. Familiar TI-84 Plus functionality in a sleek new design that features a crisp color screen. Power Source: Battery. Type Graphing. Model TI-84 Plus. Power Source Battery. make Supersized seem small. Is ready for use. Many computing facilities and the 2 lines, as well as 10 2 digit display are other features of the computer. Modell TI-84 Plus. Das Symbol der durchgekreuzten Mülltonne bedeutet, dass die Batterie nicht in den Hausmüll gegeben werden darf. Images for illustration purposes only. Other Drives and Storage. Tape and DAT Drives. Hard Drive Caddies. CD & DVD Drives. USB/Pen/Key/Flash Drives. Drives and Storage. Wireless Networking.